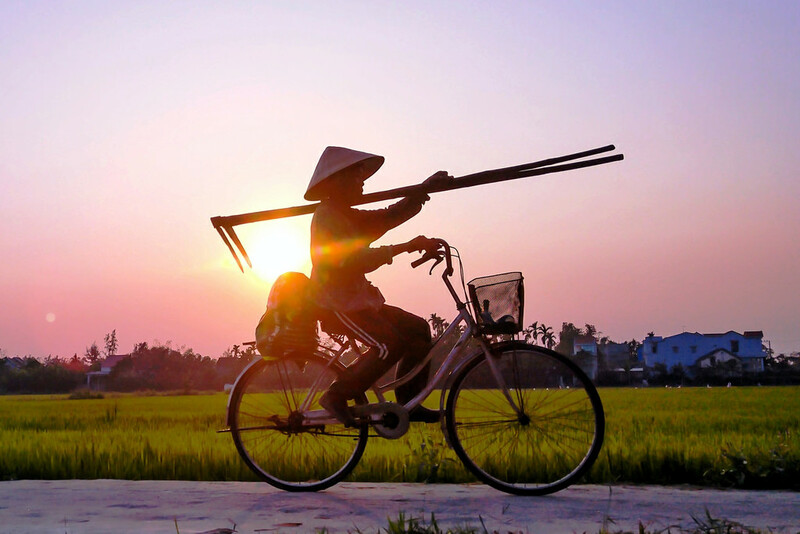 Our one-of-a-kind cycling tour from Hue to Danang and Hoi An is an awesome experience to see the most lovely beachfront mountain road of Vietnam and observe the rustic countryside. Likewise, this is a unique chance to explore Hai Van Mountain Pass and the popular world heritage destinations of Hoi An and My Son. The schedule should be possible for those beginning in Hoi An and needing to stop in Hue. In the morning, tour guide of Ultimate Odyssey Travel will pick you up at the hotel in Hue and head to the countryside by private vehicle. Start riding on rugged trails which pass through rural villages, beautiful rice paddies, rivers and woodlands. Enjoy a short break by savouring lunch at local restaurant and take a moment to enjoy Lang Co beach. When we are ready, we will cycle through Hai Van pass which is glorified by BBC’s Top Gear as the most stunning coastal mountain road in the planet. Continue riding southwards along the coast to the hotel in Da Nang. Spend the night in Da Nang. Morning (8:00am) we can take a visit to the Da Nang history museum in the city, cycling out of Da Nang city to Marble Mountain, hike up the mountains to discover many natural caves in which Buddhist sanctuaries have been built over the centuries. The Marble Mountains surrounding the area which are five stone hillocks - when islands made of marble - and each is said to represent one of the five elements of the universe. Keep riding to Hoi An ancient town. Have lunch at a local family in Hoi An. In the afternoon, we start biking to Hoi An countryside, visit Cam Thanh fishing village and take a boat ride to find the wetland and palm woods of the area. Relax and Have your own dinner in Hoi An. 8:00am: We begin our journey by riding on the back streets to see the colorful market of Hoi An to the Thu Bon river, load all bikes on a ferry and depart to Cam Kim. Admiring breathtaking sceneries of Hoi An and discover riversides dotted with verdant islands… After reaching the destination, we will visit the carpentry town to discover how wooden river boats are made, then ride along on your own bike through the quiet trails to My Son. Our guide will take you into the My Son sanctuaries, giving you the chance to walk and discover the ancient temples with its unique structure, and listen to the history and culture of Champa from 2th to 15th century. In the afternoon, our minivan will take you back to Hoi An and you will have leisure time for beach relax or exploring further of Hoi An ancient town. Tour ends at your place in Hoi An. Ultimate Odyssey would love to accompany with you! This ride is truly extensive, so we ensure that it is also adaptable in distance. We know the best sections to ride, and if you let us know your wellness level, we make sure that you will be presented to the best segments of biking while our support van is always ready by your side.